(Best Scuba Diving Spots In The World) We, as humans, live in a world of full of skyscrapers, houses, roads, and trees. Ironically, our concrete world only takes about 29% of our beautiful blue planet. The rest 71% comprises of the world that is completely different and so mesmerizing. Humans have always been curious about the underwater world, filled with mysteries, beauty and much more. So, one of the best ways to explore it would be scuba diving. Scuba diving is probably the best form of underwater diving. It makes us feel so alive that we literally become aware of each and every breath that we take. While there are hundreds of scuba diving locations across the globe, some are better than the rest. Also read: 13 Traits of a Sea Lover! Hence, here are 5 best scuba diving spots in the world, everyone should visit! 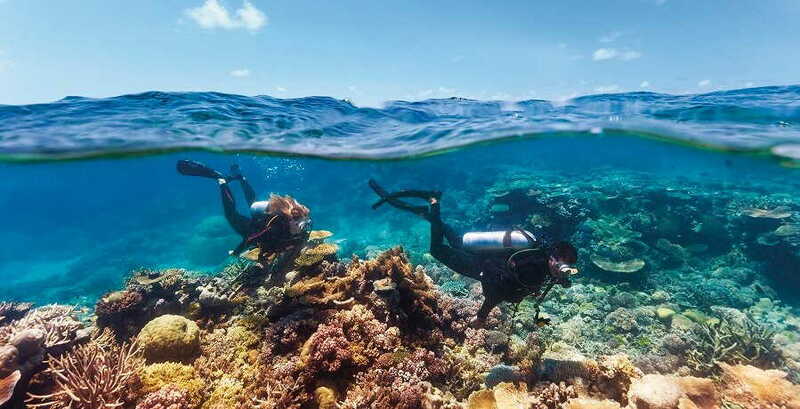 At number 1 in our list of best scuba diving spots in the world is the Great barrier reef. This place certainly doesn’t require an introduction. The Great Barrier Reef is the largest and richest coral reef system located near Queensland, Australia. Its diversity in marine life is simply the best. Right from the sea turtles and sharks to barracudas and dolphins, almost every sea creature can be found here. Along with this, there is plenty of shipwrecks too. This reef is the ideal destination for amateur as well as professional divers. This reef has been placed 1st in this list for a reason. It is because of its quick degradation due to bleaching. So, don’t wait any longer to visit this place, as it might be too late then. Galapagos Islands, in Ecuador, is a place full of amazing and awe-inspiring underwater life. It is believed that this is the place where Charles Darwin had carried out his research for the evolution theory. The Darwin Island and Isabela Island are most famous here. These islands are home to some of the most exotic sea creatures like penguins, sea lions, marine iguanas, etc. From watching hundreds of hammerheads passing by to playing with dolphins, one can experience everything here. Thus, this place is at number 2 in our list of best scuba diving spots in the world. Belize, is a small country in Central America, just beside Mexico. It is most famous for its underwater sinkhole, about 400 feet deep, called the Blue Hole. This wide hole is a World Heritage Site, housed with numerous stalactites, stalagmites, and caves. However, the Blue Hole does not have any marine life inside, except for reef sharks. This makes it apt for adventurous and experienced divers. Additionally, the reef offers many species of sharks, colorful fish, rays and much more. Hawaii, in the U.S, is basically made up of islands only. 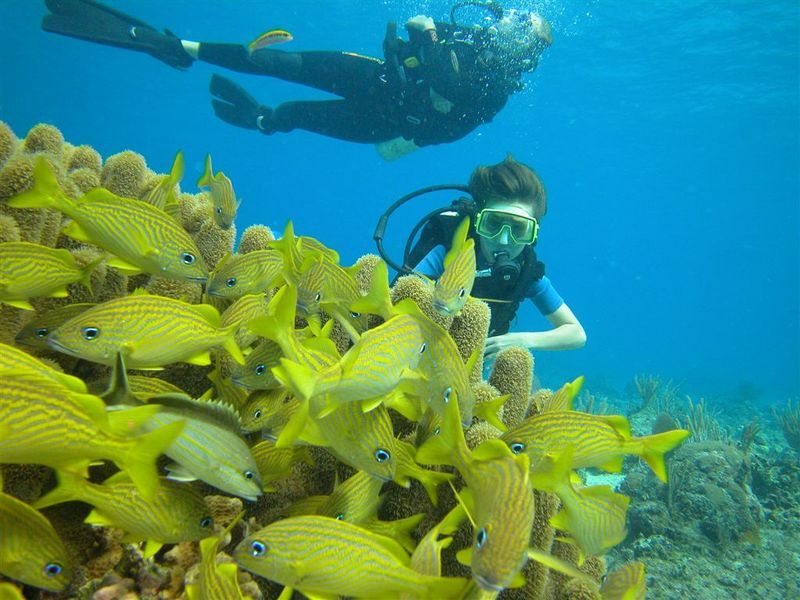 Though Hawaii is popular for almost all of its water activities, its scuba diving experience is one of a kind. The marine life might not be in abundance here but, it still contains many rare species like Hawaiian monk seal. Another interesting creature found in these waters is the huge humpback whale. The major attraction for scuba diving is Kailua Kona’s manta ray night dive. Diving deep into the darkness, amongst hundreds of manta rays, is considered as a truly wonderful experience by many. While Egypt is popular for the Pyramids, it has a hugely underrated coral ecosystem and marine life. The Red Sea in Egypt contains a treasure of shipwrecks and fish species. With excellent visibility in these warm waters, it is definitely one of the best scuba diving spots in the world. Tuna and different types of eels inhabit here. Yolanda and Thistlegorm are the popular shipwrecks in this sea. Apart from this, diving instructors are easily available, which may not be the case at many other places. Disciplined, loyal and sincere. Really passionate about traveling, drawing, food, fashion, and fandoms. Writer at The News Geeks.